(Nanowerk News) Ultracold atomic gases have been widely considered as ideal platforms for quantum simulation. Thanks to the clean environment and the highly tunable parameters in these systems, many interesting physical models can be simulated using cold atomic gases, and various novel many-body states have been prepared and probed experimentally. The recent experimental realization of synthetic gauge field in ultracold atomic gases has significantly extended the horizon of quantum simulation with cold atoms. As a special form of synthetic gauge field, synthetic spin-orbit coupling has attracted much attention recently. Professor YI Wei from University of Science and Technology of China, Professor ZHANG Wei from Renmin University of China, and Professor CUI Xiaoling from Chinese Academy of Sciences reviewed the recent theoretical studies on various novel pairing superfluid phases in spin-orbit coupled ultracold Fermi gases. They showed that spin-orbit coupling modifies the single-particle spectra, which gives rise to exotic few-body correlations and interesting pairing states. The review article was published in SCIENCE CHINA Physics, Mechanics & Astronomy ("Pairing superfluidity in spin-orbit coupled ultracold Fermi gases"). 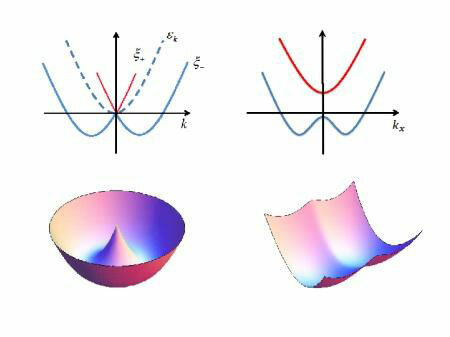 In condensed-matter materials, spin-orbit coupling plays a key role in many interesting phenomena, such as quantum spin Hall effects, topological insulators, and topological superconductors. With the availability of synthetic spin-orbit coupling as a tool of quantum control, people hope to simulate various topological phases, the topological superfluid state in particular, in the highly controllable environment of ultracold Fermi gases. Indeed, recent theoretical studies have suggested that exotic superfluid phases and novel phenomena can be engineered with carefully designed configurations. By reviewing these theoretical studies, YI et al. discuss the exotic superfluid phases in systems with different spatial dimensions and with different forms of spin-orbit coupling. A fundamentally important effect of spin-orbit coupling is the modification of single-particle dispersion spectra. The review focuses on how this effect leads to interesting pairing phases such as the topological superfluid state, various gapless superfluid states, the spin-orbit-coupling-induced Fulde-Ferrell state, and the topological Fulde-Ferrell state. Besides many-body physics, the change in the single-particle dispersion can also induce novel few-body correlations, for example, a three-body bound state in the absence of any stable two-body bound state. These interesting few-body states, if observed, should no doubt give rise to even more exotic many-body properties.